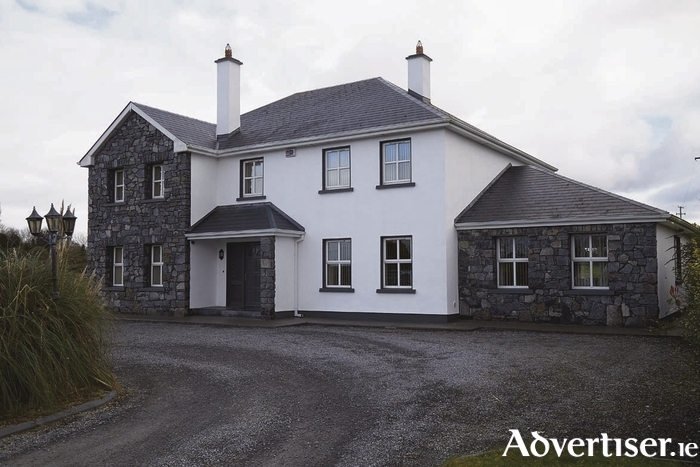 John Roche auctioneers is offering this spacious family home close to Claregalway and just 15 minutes from Galway city. Located in the popular village of Kiniska just 1.5km from Claregalway, this detached four bedroom home offers 298.4sq m of living space. The house stands on a 0.22Ha site overlooking the surrounding countryside. The ground floor comprises an entrance hall, kitchen/dining, living room, study, games room, conservatory, utility, and toilet. The first floor has four bedrooms, two en suite, large bathroom, large hot press, and a stairway to the attic which is converted for storage. This property is completed to a very high standard both inside and out. The interior offers an abundance of space and stunning finishes. It is a wonderful family home constructed to a very high standard with many extras including hollowcore first floor, solar panels, ofch, and gas fires. The house is alarmed and wired for cable television. The gardens feature beautifully presented lawns and there is also a large garage (59sq m ) with attic storage and a separate fuel storage shed. There is ample parking and the property is wheelchair accessible. The property has a BER of C1 on BER cert no 109624767. Open viewings will take place on Sunday, April 9, from 12 noon to 4pm, and viewing is highly recommended. For more information contact John Roche auctioneers at 093 39680.